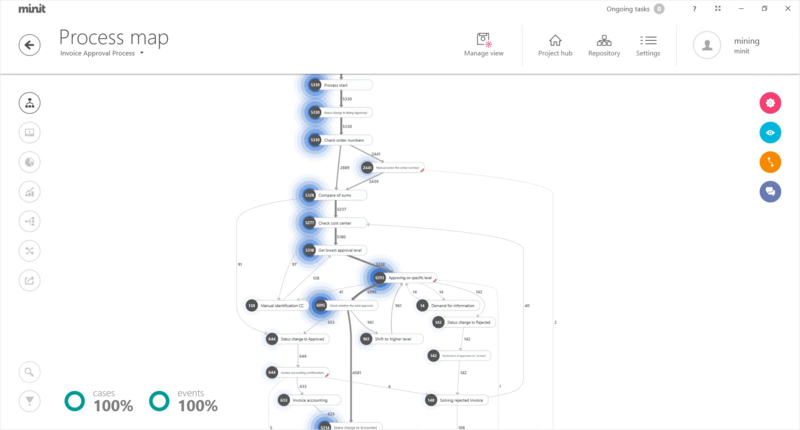 Achieve process excellence with Minit’s actionable insights into your business processes. Discover untapped potential for efficiency across the enterprise. 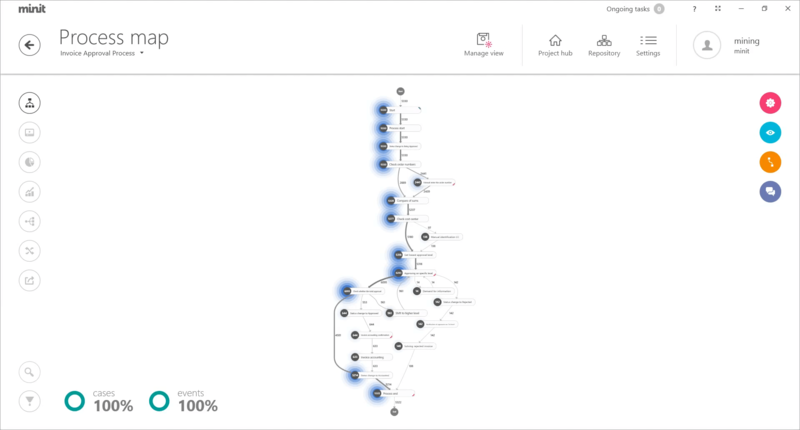 Minit’s data-driven process analysis helps you achieve your business goals. From mid-sized companies to large enterprises in any industry, Minit can analyze and increase efficiency of any processes. Instead of relying on inaccurate personnel interviews, Minit analyzes real data from systems involved in the daily running of your business. 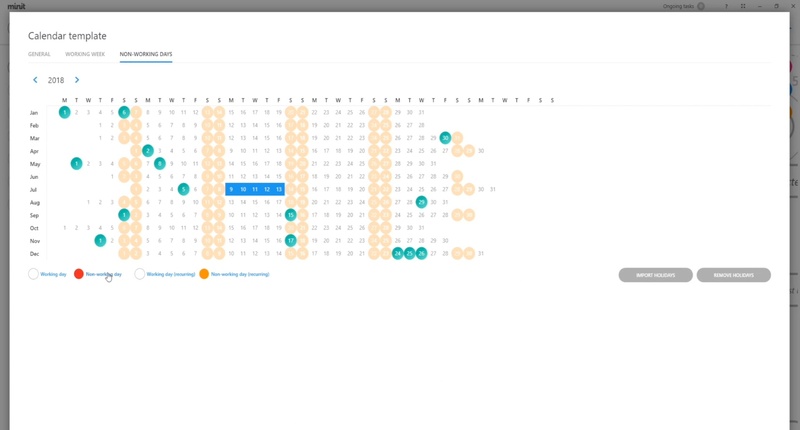 Minit shows you broader patterns as well as individual cases and helps you discover connections, causes, and solutions. Minit is able to analyze millions of events on the fly. Analyze 100% of data with a precision impossible by traditional methods. 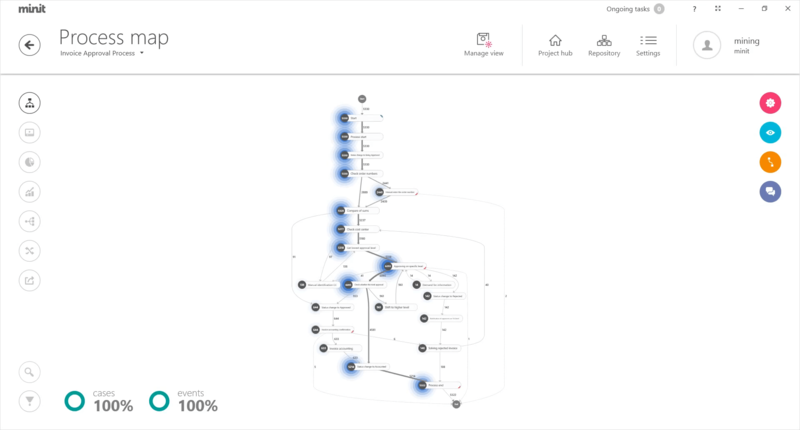 With process mining software Minit you can enjoy an extreme performance, sophisticated collaboration, robust connectivity options, BI tool integration and much, much, more. All actions that are taken by individuals within any business process, including actions performed by the IT system, leave traces in the form of event logs. 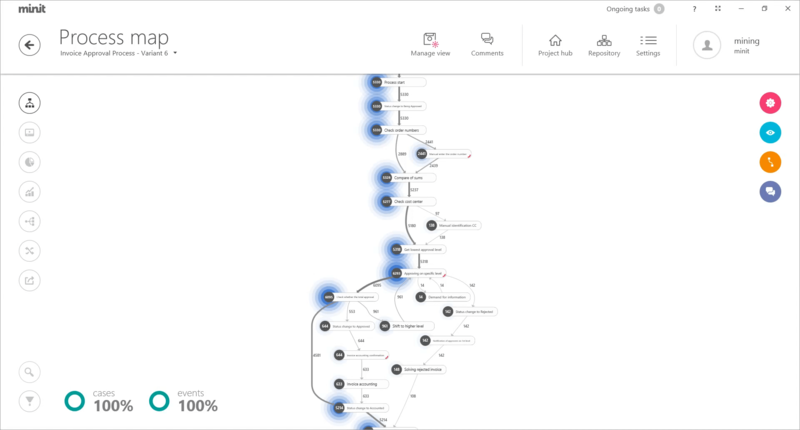 Minit uses these logs to discover the process and create an interactive process map. 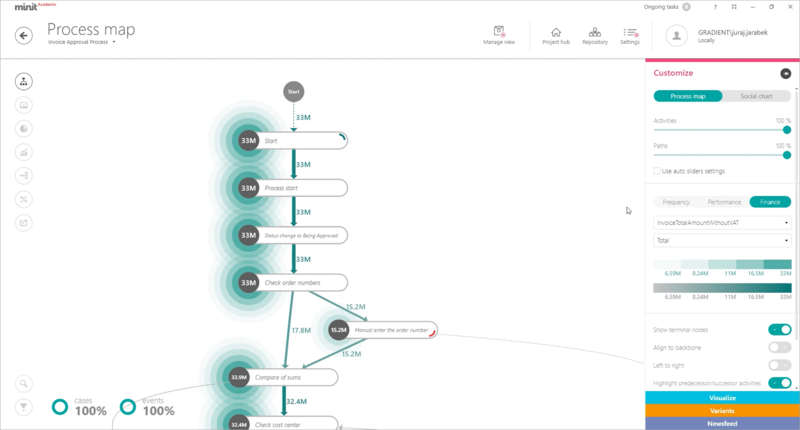 Minit accurately visualizes all the variants of the process and lets you filter and drill down into the details based on different metrics. 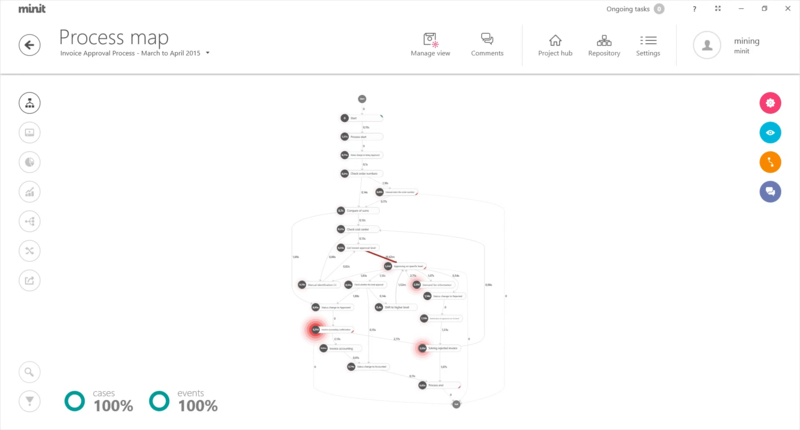 Minit automatically analyzes your business process and detects hidden vulnerabilities. 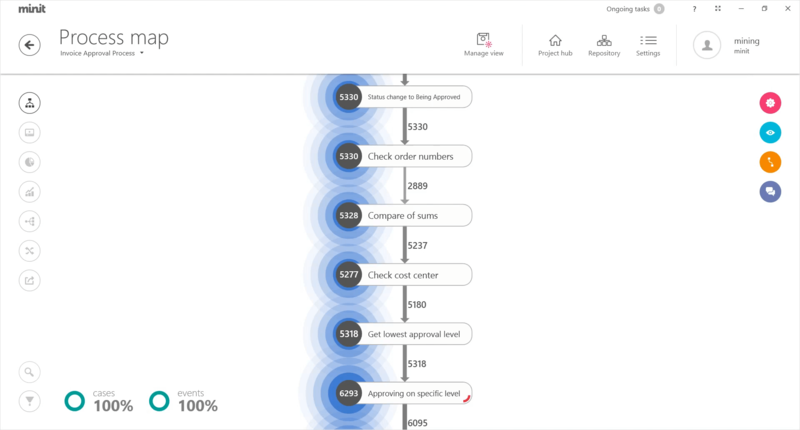 Minit highlights process variants that differ from the most common process path and makes it easy to spot inefficiencies and process steps that are taking up time and driving up costs. You can spot where time gets lost through bottlenecks, unnecessary detours, or where compliance issues may arise. Minit shows you the frequency of individual process steps and also processing times. Apply filters to see total and mean times, and determine optimal processing times, fastest paths, identify most productive team members, most reliable suppliers and much more. Minit will also detect delays caused by the inefficient integration between different systems used within the process. Compare different processes to drive continuous process improvement. Spot differences between regions, departments, teams or just to compare different time periods. Compare different views, filtered by various criteria, visually, as well as on data level. You can also compare specific Activity/Path and Social Networks. Minit makes it easy to find the best performing process and learn from it. Understand how and where the money flows in your processes. Measure the cost of unnecessary rework by adding the costs per resource into your event log with working hour rates of your employees. Determine if performance is aligned with appropriate benchmarks by adding fixed costs or revenues for specific events or activities such as a plumbing installation, outsourced marketing research, etc. Or analyze costs per case by adding the costs or revenues of your cases such as invoice amount, purchase order value, loan amount, etc. Everybody knows that a customer request initiated on Friday and answered on Monday is not the same as one received on Monday and responded on Thursday. But taking time into account within an analysis is complicated. The year, the location, specific business hours and local holidays are influencing your results and findings. If you need the precise duration in every case, you have to consider every such exception. Minit lets you specify working days and working hours and take them into consideration when analysing processes to precisely measure SLAs. And you can perform business hours-aware performance analysis with Minit on huge data sets, without decreasing performance. Data Refresh functionality and Process cloning are giving you the opportunity to use the import configuration of your process and reuse it to refresh the underlying data. Use Data Refresh when you get new data similar to the original dataset, or new data has been added to the dataset. Your process including all the views will be updated with new data, applied filters will be reevaluated, and if anything is not consistent (e.g. the filtered variant no longer exists), we will tell you. Use Clone to a new process to compare new data to the original one (e.g. compare data from 2016 to data from 2017 if you made changes to your process and want to evaluate the impact). In this case, the configuration is used to import the new dataset, allowing you to use Minit’s state-of-art process comparison functionality. Check the data quality of your event log. 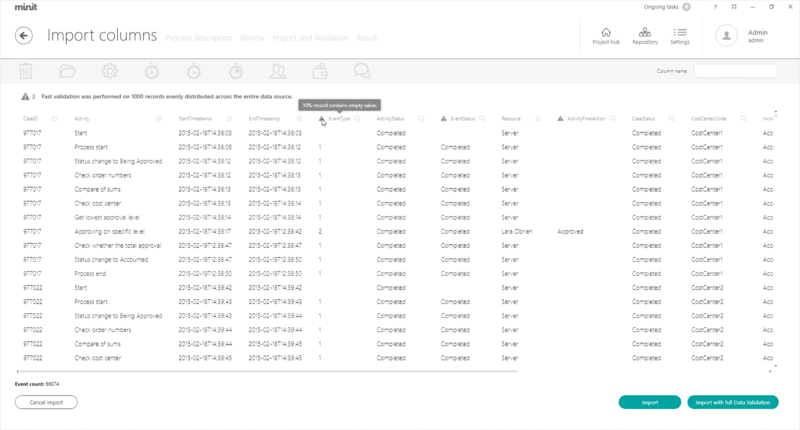 With Quick Data Validation built directly into preview screen of Process Import Wizard, you can check attributes for 1000 selected events and immediately see issues categorized by their severity, plus how changes in configuration affect the results. To be 100% sure, use Full Data Validation. At this level, Minit will check all data from first to the last event giving you a complete overview plus full interactive HTML report. With Minit, it is easy to create PowerPoint presentations, analytical reports, process description handbooks and all different outputs of the analysis. You can export everything you need – not only filtered event level data but also case level aggregation, process map as image or XML structure, animation as MP4 video, charts and statistics as image or CSV – immediately and in high quality, so your outputs look just fantastic. Anytime your analysis comes to an important point, you can save it as a View and discuss the results and steps that took you there with colleagues. 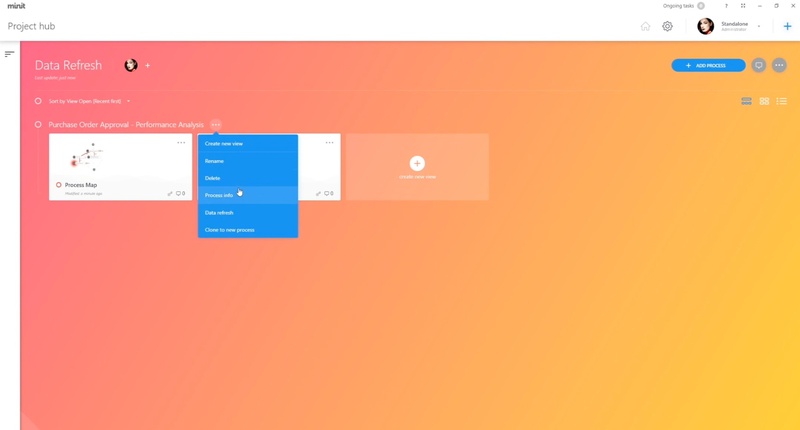 With a newsfeed in every View, you can save all important private notes and shared team conversations for future reference. When words are not enough, take an interactive snapshot of the state of your analysis. When colleagues open it, they can see what you saw and continue in the work. Whether in the cloud, on-premisses or standalone Minit can be up-and-running in a very short time and with little effort. Minit can connect and extract data from practically any system used in the running of your company - ERP, CRM, Service Management, BPM, LOB, Call Centers, and more. Get a free trial version of Minit and try out all of its functionality. Schedule a call with one of our experts or ask for demo presentation. Do you have any questions? We are happy to help. Write to us!